3 hours of climbing through various courses of the climbing forest. Students from 8 to and including 17years and a minimum body height of 1.30m will have loads of fun here! For every school class of 25 kids two adults climb with them free of charge! Prices: Up to 100 participants €12.00 per student, above that €10.00 per student! 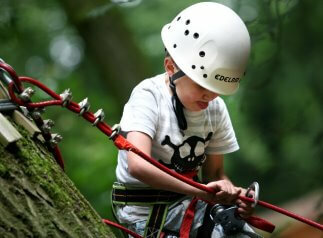 Here you will not only go climbing for 3 hours, but also play the Forest Adventure afterwards with the kids. This adventure consists of various team building activities. Which means there will be two different activities which can be switched between the groups. Prices: Up to 100 participants €24.00 per student, above that € 20.00 per student!